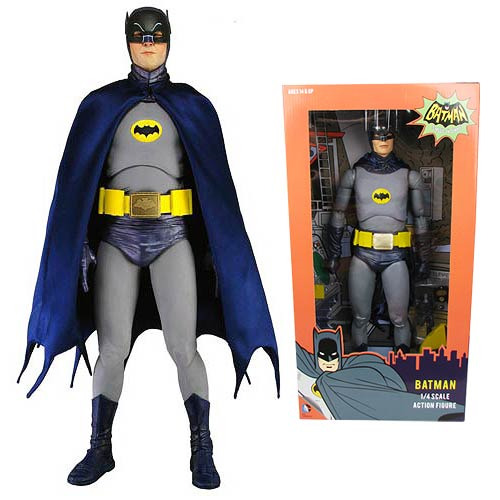 If you've ever wanted an extra-large figure of Adam West from the 1960s Batman television series, here's your chance! This Batman 1960s TV Series Adam West 1:4 Scale Action Figure stands 18-inches tall and features over 20 points of articulation. Batman is poseable at the legs, knees, and ankles, and even includes a functioning utility belt, interchangeable hands, and more! This definitive action figure in actor Adam West's likeness is just about mandatory for anyone who grew up loving the original Batman television series. The action figure is all sculpted but has a fabric cape. The utility belt opens in front to show the communicator inside and the batarang can clip to the belt when folded up. Accessories include 3 pairs of hands, a batarang with rope, a batarang that folds open/closed, a walkie talkie, an extra belt pouch, and a holster for the batarang! Ages 14 and up.